Took a drive out to the river the other day. It's high water time, so I hadn't planned on fishing. Still, it's good to get out of the house for a few hours. Walk around, shoot a few photos, breathe the sweet spring air. Everything is green. Finally. There's no annoying bugs yet either. Don't worry, they're coming. Do you know where your bug dope is? Best of all, I came home with a prize. A massive haul of three morels. Not quite enough for a meal. Luckily I'd accumulated a stash of dried ones over the years. They've been stored in glass jars waiting for a date with the frying pan. The fresh ones are more flavorful, less rubbery. But, the dried ones do in a pinch. So, tortellini with morels and asparagus. Today was the day. It's a simple dish. 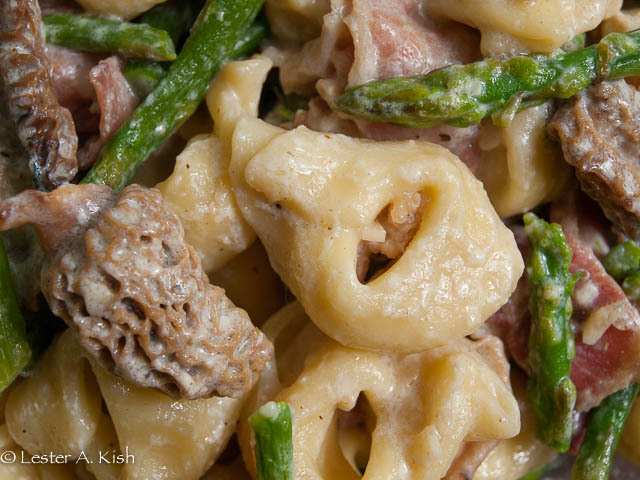 Along with the tortellini, asparagus and mushrooms, butter and bacon round out the flavors. And, there's a little garlic for vampire abatement. A little parmesan. A splash of milk. Done. 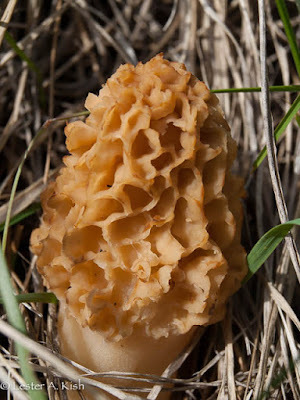 Maybe I'll hit the mother lode and find four morels next time out. Yes they were. Good luck on your hunt for some in those burned areas. Great fish too on the recent blog post. Bill, I think that morels can be found throughout the country. Probably some in your neck of the woods too. Expensive too as you've noticed. I've seen a handful (about a half dozen) of dried ones priced at around ten to twelve bucks in our local supermarkets. This particular dish was good and easy. The bacon didn't hurt it one bit either. As for the Portobello mushrooms, we have boletes out here. They're similar, big and meaty. I've seen some with caps as big as frisbees. Blogger made some changes to the blog platform. I didn't get notifications when you folks commented. Heck, I didn't notice when my own comments were published either. Not very user friendly.